Elsie Bishop was born (as Elsie Lovett) in Quorn in 1912. She married her husband Roy in 1933 and they lived at 27 Nursery Lane. 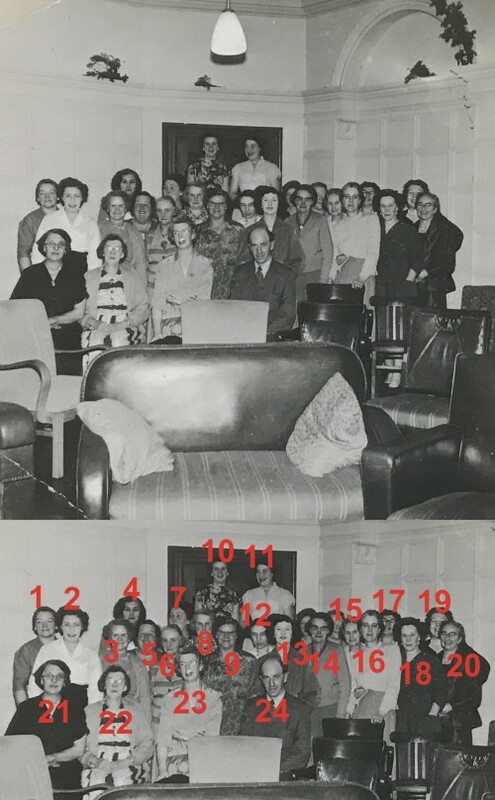 Elsie was a cleaner and waitress at Quorn Hall and this photograph was taken from her album. The occasion is thought to be a party to celebrate the wedding of Frank Ockenden and Kathleen Burns in 1958. Frank and Kathleen both worked at Quorn Hall. Elsie is on the right (number 20). 23 Matron (Kathleen) Ockenden (nee Burns). Can anyone help with any more names? Missing information: Can anyone help with any more names?